America's ag industry is aging fast, but Minnesota has introduced new legislation to attract young farmers. 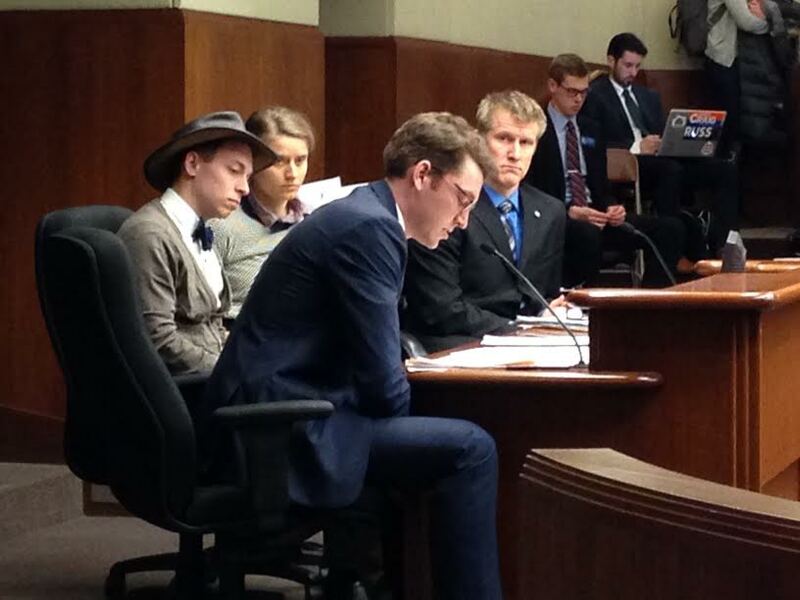 Matthew Fitzgerald of the Minnesota chapter of the National Young Farmers Coalition speaking at the Minnesota state house agriculture policy committee hearing on Feb. 22. To his left is Andrew Barsness, the CMNYFC leader. The average U.S. farmer is approximately 59 years old. Considering that only four percent of Minnesota farmers are under 35 years old – below the already desultory national average of six percent – this new program could help get newbies onto the land, since things like finding farmland and student loan debt are some of the major barriers keeping the next generation from becoming farmers. Fitzgerald helped found the Central Minnesota chapter of the National Young Farmers Coalition, a non-profit dedicated to helping young and beginning farmers. His organization, along with several others in the state, worked to get the new law passed. America’s ag sector is greying fast. The average age of the U.S. farmer is hovering right around 59 years old. Nearly one-fourth of all farmers are expected to retire over the next 25 years. But between 2007 and 2012, the number of young farmers increased by only 1,220. Fitzgerald tells Modern Farmer that land ownership is critical for new farmers – it allows them to focus on a long-term plan for their farm and helps them build equity, which is important to keep a farm operating and for potential expansion. The specifics of the bipartisan bill, which was signed into law last month by Gov. Mark Dayton, are pretty straightforward. Landowners get a state income tax credit when they sell or lease land, or even farm equipment and livestock, to a beginning farmer. It’s either a five percent credit of the sale price, or, for leases, it’s 10 percent of the rental income for the first three years, among other incentives. In return, the beginning farmer has to take a farm management class, the cost of which is also covered by a tax credit. The hope is that the new Minnesota law can be a blueprint for similar legislation in other states. Fitzgerald says his organization has been in touch with other chapters of the National Young Farmers Coalition (NYFC) to talk policy, strategy, and sharing incites about what it took to get the law passed in Minnesota. According to Sophie Ackoff, the national field director for NYFC, the need to support the country’s young farmers is an issue of national concern and requires a multi-pronged approach encompassing reforms in the tax system, the federal farm bill and the USDA. “NYFC plans to help our chapters lead similar campaigns in other states to bring this legislation to scale,” she says. To that end, 12 farmers from across the country who are part of NYFC flew to Washington D.C. on June 7 to meet with their legislators about issues affecting young farmers like land access, student loans, and health care, among other issues. Specifically, they discussed how these issues can be addressed in the 2018 farm bill – the omnibus ag and food-related legislation that’s supposed to get an update every five years. NYFC is hoping the next farm bill keeps funding some current programs aimed at helping young and beginning farmers, which is far from certain in the current political climate. Among them are the Beginning Farmer and Rancher Development Program – the only federal program specifically dedicated to training the next generation to farm – and the Agricultural Conservation Easement Program (ACEP), which helps eligible organization purchase the development rights on farmland by matching up to 50 percent of the cost of an easement, preventing farmland from being turned into another strip mall or housing development. The organization is also pushing for a student loan forgiveness program for young farmers as part of the farm bill, as well as an increase in funding to the USDA Farm Service Agency (FSA) – which is responsible for loaning money to farmers – so that the agency can keep pace with demand in the face of declining farm incomes and dropping commodity prices. Ackoff says they left D.C. feeling “more confident that young farmer interests will be included in the next farm bill.” For Fitzgerald, who was also part of the group that went to the capital, it was inspiring to meet other farmers from across the country who are facing some of the same challenges he is, and to meet with his legislators.